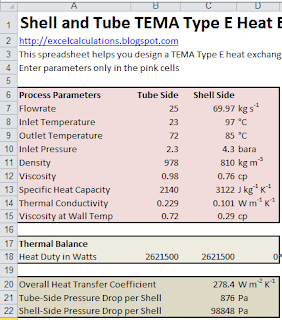 This Excel spreadsheet helps you design a TEMA Type E heat exchanger. The spreadsheet uses the Bell-Delaware method to calculate the overall heat transfer coefficient and the shell-side pressure drop. The spreadsheet allows you to pick from a triangle, square or rotated square tube placement, and specify the precise geometry of the shell, and then calculates the shell-side pressure drop and heat transfer coefficient accordingly. The spreadsheet contains several empirical correlations, including those to calculate the Colburn J factor (used in determining the shell-side friction factor) and the pressure drop. The correction factors adjust the ideal heat transfer coefficient for leakage effects, bundle bypass, baffle spacing, and baffle cut. The correction factors are all calculated inside the spreadsheet for your convenience. The product of all the correction factors are equal to about 0.6 for an efficiently designed heat exchanger. The spreadsheet is easy to use. Simply enter the process parameters (i.e. flowrates, temperatures, etc) and the geometrical parameters (number of tube passes, shell dimensions etc) in the pink cells. 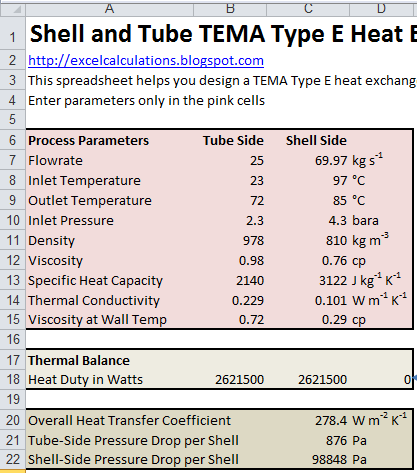 You will need to equalize heat transfer across the shell-side and tube-side streams by varying a process parameter (this is indicated inside the spreadsheet).